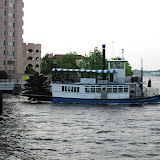 Last night we headed downtown for dinner at a sidewalk cafe and a riverboat ferry ride. It was a beautiful evening, breezy and mild. We had a great time and the kids loved the ferry trip across the river. We caught an opening of the bridge that connects Portsmouth to Norfolk...a road we travel frequently. Aiden thought it was sooo cool to see the highway open up toward the sky. I've added a slideshow of our pictures.